The pilgrimage route of Spain’s Camino de Santiago (“Way of Saint James”) is full of the history, legends, and traditions of the seekers and adventurers who have followed it for the past 1,100 years. Easy Rider Cycling tours offers guided trips for modern-day pilgrims who want to experience the historic route by bicycle. The Camino de Santiago (“The Way of Saint James”) is an 1,100-year-old pilgrimage route across Spain ending at Santiago de Compostela, where, tradition has it, the bones of the saint are buried. Seekers and adventurers from around the world sojourn to Santiago under their own power – by foot, bicycle, even donkey – to earn that most esteemed souvenir: the compostela, or certificate of completion. It’s a challenging journey, complete with mountain passes, unpaved roads, and weather that can be less than cooperative. Easy Rider Cycling Tours, an adventure travel company that specializes in European bike trips, has been guiding bicycling tours along the Camino since 1998. 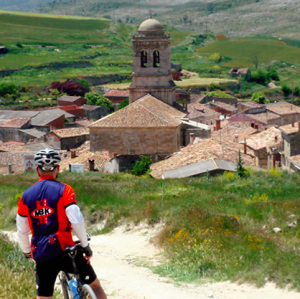 Easy Rider’s Camino bike tour follows the Camino Francés (the “French Route”) across northern Spain to Santiago. The 11-day bike tour begins in Burgos, and covers 330 miles. (A shorter, 8-day version begins in Leon; biking distance is 210 miles.) Each group is accompanied by two multilingual native guides, whose expertise and knowledge of local customs, culture, and Camino lore bring extra depth to the bicycling pilgrims’ experience. In addition, a support van is always available to carry luggage and offer whatever assistance cyclists might need, be it a snack, a tire change, or a lift. Easy Rider’s Camino accommodations are specially selected to enhance the historic experience. Guests stay in refurbished monasteries, manor houses, and country estates, with the final night at the five-star Hostal de los Reyes Católicos, the most famous of Spain’s renowned paradors. Cycling pilgrims burn a lot of calories, and Easy Rider’s unofficial motto “Ride to eat, eat to ride” is taken seriously! Each day begins with a breakfast buffet; sumptuous dinners feature regional specialties accompanied by local wines (which are included in the tour price). “El Camino de Santiago” bicycle tour dates for 2011 are June 23-July 3 and September 7-17 for the 11-day tour, and June 26-July 3 and September 10-17 for the 8-day trip. All departures are guaranteed. Per-person prices are $4,350 and $3,550, respectively. The tour price includes all accommodations, most meals, nutritious snacks en route, use of a 27-speed bicycle, two highly experienced guides, and a support van. Custom group bike tours can also be arranged. Groups are limited to 16 guests. For more information on the Camino bike tour, and a complete 2011 schedule, contact Easy Rider Tours at 800-488-8332 or visit www.easyridertours.com. Since 1986, Easy Rider Tours has specialized in biking vacations in Spain, Portugal, Ireland, the Canadian Maritimes, and New England. Each of Easy Rider Tours’ itineraries provides a satisfying balance of cycling, culture, and cuisine, delivering the experience of a lifetime to active travelers worldwide.